Our products are very versatile and can be applied virtually everywhere in a home. The most common locations for insulation are attics and walls. However, to gain the maximum impact and energy savings from your insulation, it should also be installed in ceilings with unheated spaces, overhangs, sun-rooms, dormers, crawlspaces, floors, etc. Cellulose insulation can also be added to interior walls and floors for increased sound proofing throughout the house. 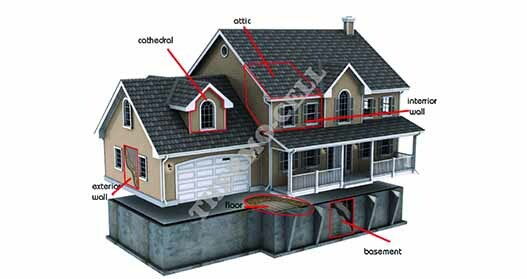 The house diagram here shows the places that we recommend putting cellulose insulation. More detailed information can be found in the product or applications section of our website.